The intersection of the creation and presentation of the arts, its role in our communities, and the transition to the next generation of arts leaders is indeed a balancing act. Global society is being shaped by many forces and this is having a fundamental impact on the arts sector. With this change, we also have opportunity not only to reflect the changing values of our broader society but indeed shape them. How will the next generation of leaders approach this evolution and further the arts as a catalyst of positive transformation? 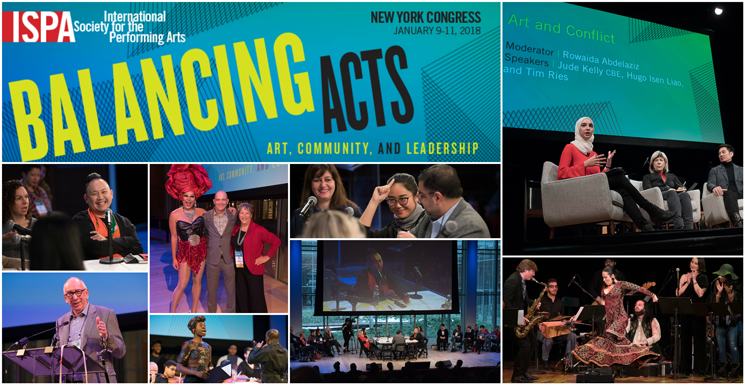 Over 600 delegates from 53 countries participated in the New York 2018 ISPA Congress. From the round table session to Pitch New Works, you can relive your Congress experience or see it for the first time if you were unable to attend. Check out the three sample videos below. ISPA members have exclusive access to the entire Congress Video Gallery. To view more Congress videos, click here and sign in to your account.